Brandy T. Wilson earned her PhD at Florida State University. Her work has appeared in Robert Olen Butler’s From Where You Dream, Ninth Letter, G.R.I.T.S. Girls Raised in the South, and Pank Magazine among other publications. She was a Lambda Literary Retreat Emerging LGBT Voices Fellow in fiction, an Astraea Emerging Lesbian Writers Fund Finalist, and was a recipient of three Bread Loaf Writer’s Conference scholarships. She teaches writing, literature, and Gender & Women’s Studies at the University of Memphis. The Palace Blues, Finalist, Lesbian Fiction. 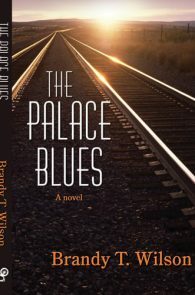 The Palace Blues, Finalist, Lesbian Historical Fiction.